This fully fenced Beach House property is centrally located close to the main beach and parks. From the moment you arrive you will love our place. It is a fantastic set-up for two families and /or large groups or for one family to spread out and enjoy the different areas and levels. All the comforts of home including flat screen TV, unlimited Broadband internet, SKY TV, and fully equipped kitchen. The Sunny first level lounge opens onto a private deck which is great for BBQ’s and relaxing. The internal access garage is a great play area for the kids with a pool table and darts board. There are kayaks and boogie boards available for guests to use during their stay. For the cooler times of the year there is a wet back fireplace that makes the place cosy in no time. Pets may be allowed with prior approval. This property is well set up to entertain and enjoy yourselves but we respect and like our neighbours so no noisy parties thanks. Please note this property is fully fenced. Was perfect for two families and with it fully fenced we didn’t have to worry about the kids. Great spot to get to the beach and an easy walk into town. Was a great weekend! Fantastic house in a great location with everything you need. This house was perfect for my family. Being fully fenced was a massive advantage when keeping an eye on our toddlers. We loved being able to take boogie boards to the beach, which really is just a short walk away. The pool table and darts board was also a massive hit! 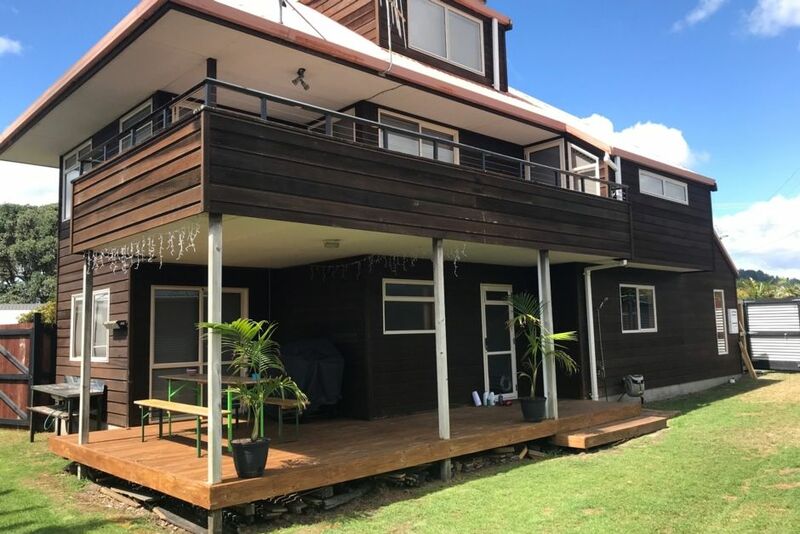 I would totally recommend this house to anyone looking for a fun-filled stay in Whangamata. Lovely, spacious house with a great beach vibe. Clean and comfortable, I highly recommend. This property was in a great location close to everything. Lots of content and plenty of room for the family and friends. The only complaint was the day we arrived I received a call from Natalie informing me the dishwasher had broken. I expected it to be fixed whilst there the 7 days but not the case. Definitely for the money you pay I did not expect to be on holiday and have to do endless dishes and washing of teatowels. Also, it really needs a dryer. Other than that a great place. Loved the property, we had family staying there for our wedding and they all loved the place. Loved the property, we had family staying there for our wedding and they all loved the place. Very clean and tidy, great location and plenty of space. Highly recommend! Fantastic place, great location with lots of extra toys like kayaks and bikes.